Delbanco’s elegiac and elegant 13th novel (Old Scores, 1997) gathers the voices of a family of German emigrant Jews to describe their “escapes” (to London, then America) from Hitler’s persecution, and their mourning for the high culture betrayed and destroyed by the Nazi regime. The family’s stories are framed by scenes set in 1996, during primary narrator (Americanized) Benjamin’s return, in middle age, to England for a visit with his dapper Uncle Gustave, an art dealer and enthusiast sustained on into old age by his love of beautiful things (years earlier, describing a purchase, Gustave had observed that “In a world . . . so full of willed barbarity, it is important that a picture with a shepherd be acquired and a claim be lodged for lastingness”). Other voices, speaking during the years 1944–64, include those of the young Benjamin and his older brother Jacob, growing up during the Blitz and amid muttered references to “Schicklgruber . . . the devil incarnate.” Delbanco creates telling indirect characterizations of their father Karl, a would-be artist who settled for becoming the dutiful son (unlike his brother Gustave) and went into business, eventually prospering (as owner of a “bristle factory”); and their neurasthenic mother Julia, embittered by the loss of the scholarly career she had sought in Germany, and by the (gratuitous and utterly false) suspicion that her husband is anything but a model of fidelity and decency. The best character here, however, is haughty “Granny” Elsa, kept alive by the wisdom of her beloved Boethius’s Consolations [sic] of Philosophy and memories of her late husband, taken by cancer before the Nazis could take him. 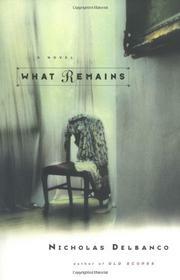 These portraits and reminiscences are episodic, and to some degree static, but What Remains is often very moving, especially for its precise discriminations between going beyond what was lost and embracing “what remains” (in a resonant phrase ingeniously adapted from Ezra Pound). One of Delbanco’s most attractive and accessible books.